I attended this concert. I took a girl I had met on July 10. We have been together for 34 years and married for thirty years. We sat within the first ten rows. This was absolutely the best concert I have seen in my life. I'll never forget her singing "A Case of You" with a dulcimer alone on the stage. It was a magical night and the beginning of my life with the love of my life...Annette. i was in the pavilion, maybe the 20th row!she was awesom!really loved the show and is one that will always be in my memory!1983 at blossom music center! !i bought the book they were selling and still have it!! I was attending Kent State University at the time, and was casually dating a guy who had gotten tickets to the show, but hadn't asked anyone to go with him yet. As the youngest of six who grew up listening to the Joni albums my brothers and sisters played (and my sister played Joni on piano and guitar too), I had no qualms inviting myself to the show! This was a great show (love the Blossom atmosphere), though I was frustrated at those people who couldn't keep quiet. 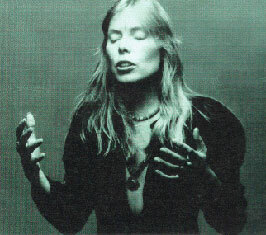 I will always treasure having the chance to see Joni Mitchell live -- esp. at a place like Blossom. It was also poignant to hear Joni while I was at KSU and all the history that goes with that school. She is and will continue to be my all-time favorite artist (music and art). Thanks Joni for allowing me to come of age listening to your amazing music.